Large pickup trucks from Ford, Nissan and Ram fared best in the latest crash testing by the insurance industry. 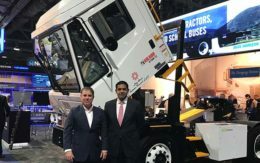 The Insurance Institute for Highway Safety just completed the passenger-side small overlap front test for pickups sold in the U.S. The test replicates what happens when the front passenger corner of a truck strikes another vehicle or an object such as a tree or utility pole. Such crashes are especially dangerous because of the way wheels and other vehicle parts can intrude into the passenger cabin. A front crash is more severe for a pickup than for smaller vehicles because the severity of the collision into a fixed barrier increases with the weight of the vehicle, according to IIHS. Of the full-size pickups, the Ford F-150, the Nissan Titan and the recently redesigned Ram 1500 all earned “good” ratings. Ford said it worked hard to earn the top rating in the overlap test. It developed a patented extruded aluminum roof crossmember and additional frame crossmember that work to improve crash resilience. Other F-150 engineering innovations include nylon hinge pillar reinforcements that save weight. They also work in conjunction with specially designed wheel blockers to control crash forces, according to Hau Thai-Tang, Ford executive vice president, Product Development and Purchasing. The Toyota Tundra failed the test and earned a “poor” rating. The Tundra experienced serious intrusion, as much as 15 inches at the lower right section of the passenger compartment, the insurance group reported. The Ford F-150, by comparison, had just 5 inches of intrusion in the same area. The Toyota also had intrusion of more than a foot at the lower door-hinge pillar. “The passenger dummy’s head hit the grab handle attached to the A-pillar as the A-pillar intruded into the passenger’s space. Measures taken from the dummy indicate that injuries to the right lower leg would be likely in a crash of this severity, and injuries to the right hip would be possible,” IIHS said. 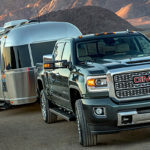 General Motors’ big trucks, the Chevrolet Silverado and the GMC Sierra, earned “marginal” ratings. Their low rating resulted from extensive intrusion into the occupant space. 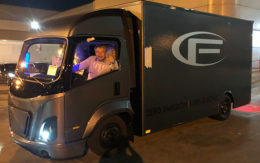 Test results from the passenger dummy recorded forces consistent with possible injuries to both lower legs, Zuby told Trucks.com. The GM trucks fared better in other tests. 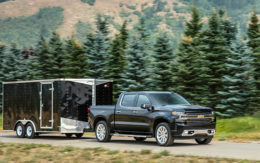 ‘When we tested the Silverado 1500 crew cab in the same type of test on the driver side, it earned a good overall rating. The structure held up significantly better. We’d like to see Chevrolet incorporate the same level of protection on the passenger side as on the driver side,” Zuby said. GM said in a statement that it continues “to develop and implement safety improvements” in its vehicles. “We are focused on the safety, occupant and restraint performance of our pickups. GM designs our vehicles to protect the occupants in a broad range of crashes including front, offset, angle, side and rear impacts,” the company said. Two midsize pickups, the Toyota Tacoma and the Honda Ridgeline, earned “acceptable” ratings. The Ridgeline is the only pickup of any size to qualify for the group’s 2019 Top Safety Pick award, because of its optional headlight system that is rated “good.” It also has an optional automated front crash-prevention system. The Tacoma fell short of a Top Safety award because of poor headlights. The Chevrolet Colorado, GMC Canyon and Nissan Frontier all received “marginal” ratings, primarily because their vehicle structures did not hold up as expected. The Tundra and the Frontier also struggled with the IIHS’ earlier driver-side small overlap test, earning just a marginal rating. IIHS noted that those trucks have the oldest designs in the test group. The Frontier’s basic structure dates back to the 2005 model year, while the Tundra’s is from 2007. Most of a group of midsize SUVs tested by an insurance industry group received only poor and acceptable crash ratings.